So Thursday night I took a look at what was going on the next day and decided to take the day off of work. 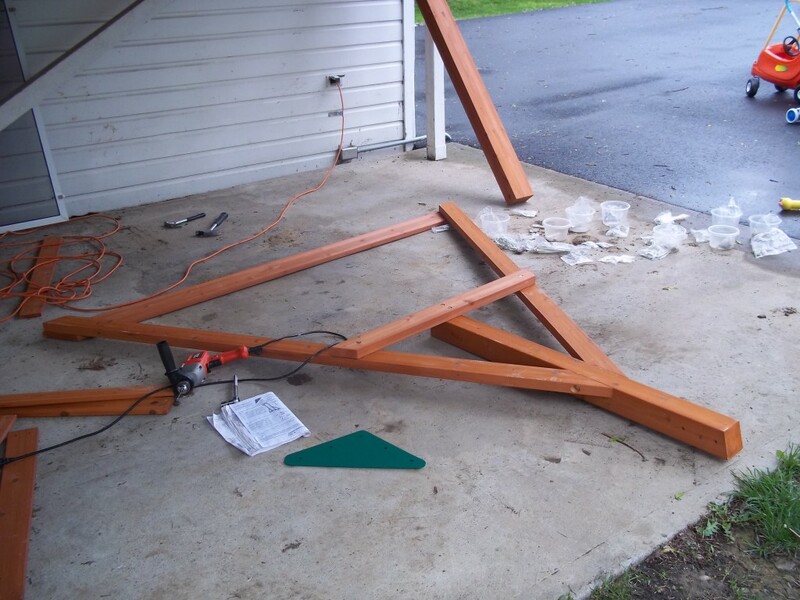 Building the playset was not the only reason, but it was definitely one factor. Also the kids were off school (due to Good Friday) so I thought it would be nice to spend some time with them. And the weather called for rain pretty much non-stop starting Friday afternoon and continuing for the next 4-5 days. 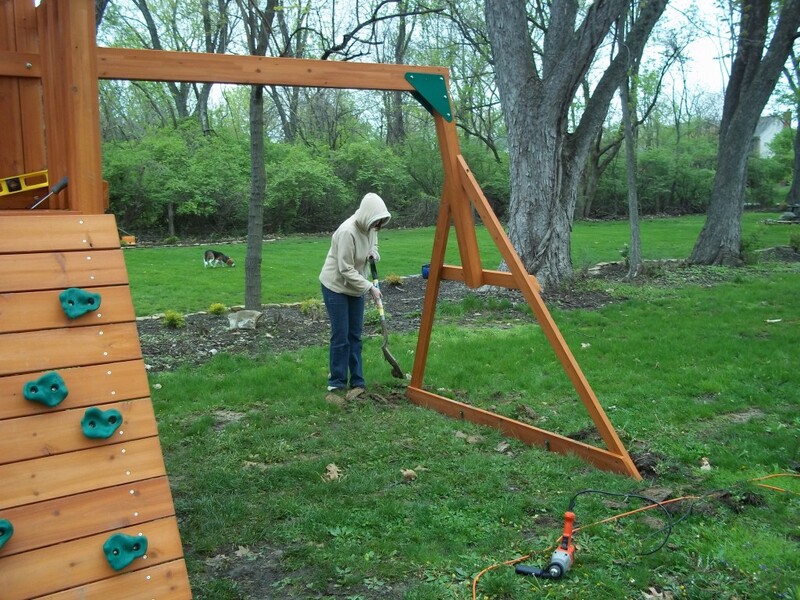 I went out about 9 a.m. and started on the next steps, which involved constructing the swingset portion. The kids were excited (even more so than usual!) because Step 84 got to use the coveted “A1″ piece. 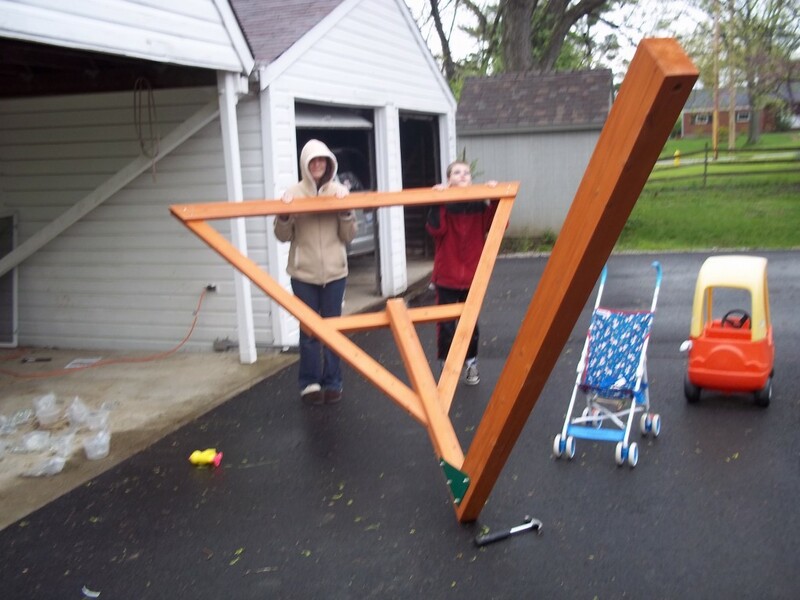 A1 is the swingset beam and is naturally the biggest piece, so the whole time we’ve been building this they’ve been looking forward to when we could use A1. And here’s that part attached to A1. It wasn’t that heavy but definitely useful to have 2 people carrying it. 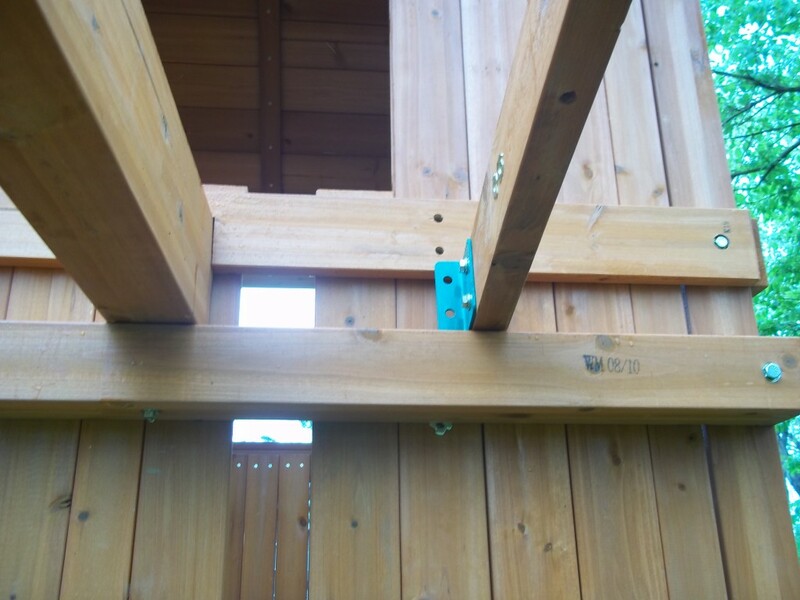 Once the swingset beam was set into place, we had to construct and place the crow’s nest area, which sits on top of that big beam. And here we ran into a problem. You can see the green “Y30-40G” metal braces, with the holes on the main clubhouse that the brace is supposed to attach to. The problem comes in that there are no holes on the board BEHIND that. I looked back on the steps where those boards were attached, and I still think that I did it correctly. You can see below the other left to right beam one of those spike T-nuts. Back in Step 52 we had to put those T-nuts in to “be used in a future step”. Originally I thought I had maybe put those nuts in the wrong place, but I don’t think so. I’m not counting that as a mistake by me. I ended up just drilling through those back boards, attaching spike nuts on the back end, and putting the bolts in. Next step was attaching the swing hangers to the beams. The next problem is that the countersunk holes were not big (or deep) enough so the fender washers would fit in those holes. The instructions were (wait for it, wait for it) pretty confusing. The text of the instructions (Step 91) just say flat washers, lock washers and lock nuts, but the picture also shows a fender washer. The countersunk holes looked like they fit the fender washers, but it was just SLIGHTLY not big enough. Also I couldn’t get all those washers in and still have enough of the bolt to attach the nut to. 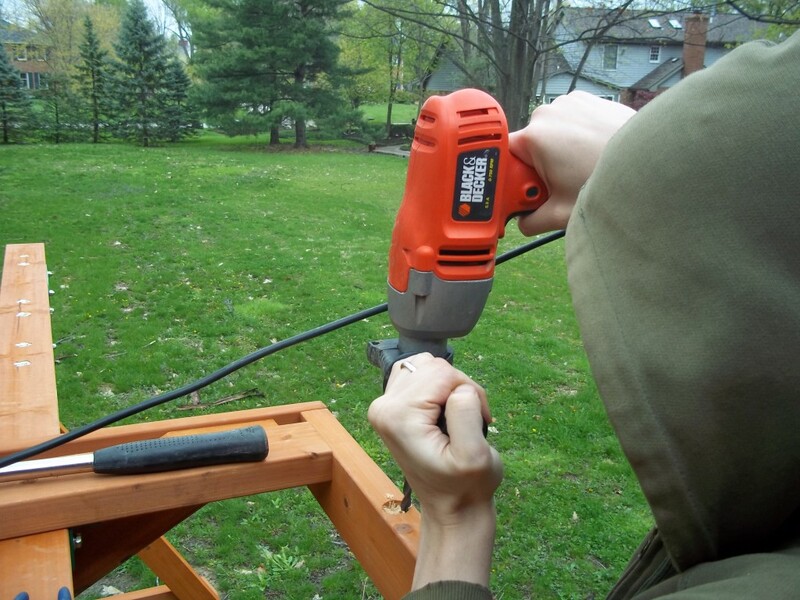 I ended up just using a drill to kind of widen the hole. After putting in the floor boards of the crow’s nest, the next problem was that we ran out of flat washers. We had used extra flat washers earlier on because the truss bolts were not snug with only 1 washer on them. So I sent Carolyn to Lowe’s to get some more washers. So that meant we had to skip Step 95 and 96, and move on to Step 97 – putting in the balusters for the crow’s nest. 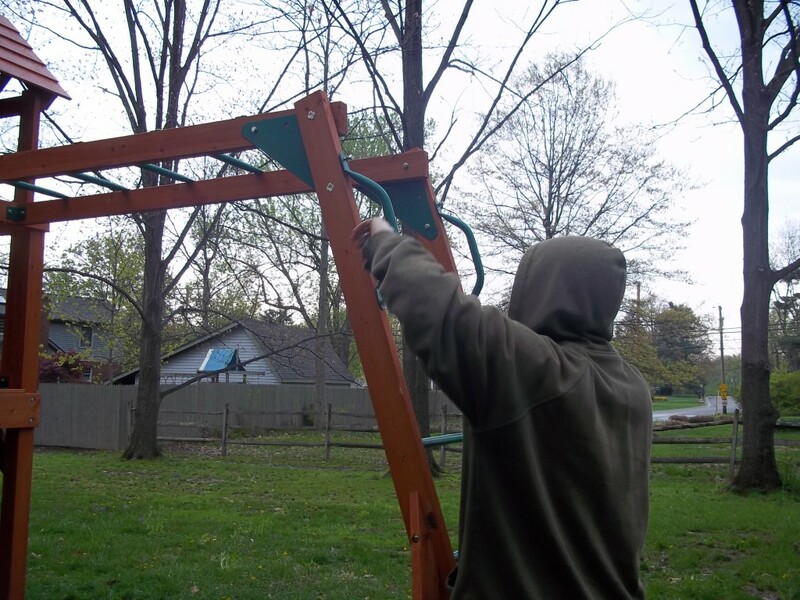 After that was done, we started putting the swings on (Step 102), because all the steps in between also needed those washers. We couldn’t put the glider on because we were missing some fender washers, but we did get the other 2 swings on. Going back to the earlier paragraph about the spike T-nuts that were put in “for a future step”, we found out what that was for on Step 99 – putting in the metal ladder rails to go up to the Crow’s Nest. That was very tricky to do as the holes did not really match up. I ended up having to really wiggle them in to get them to “catch” on the nuts but eventually I was able to get it in. Last few steps were attaching the metal grips on various places. Here I am putting the grips on one end of the monkey bars – they went in on both ends of the monkey bars, the top of the rock wall, and the top of the ladder. Cue massive thunderstorms and heavy rain! I REALLY wanted to finish things up and get the slide on, but alas it was not meant to be. I worked on it some but just didn’t want to mess things up, so I decided to save it for another day. Plus, using my power drill (with the cord running through pools of standing water) in a thunderstorm didn’t seem like QUITE the best idea…. Nice picture of me taken from the dryness of inside. Getting close!! 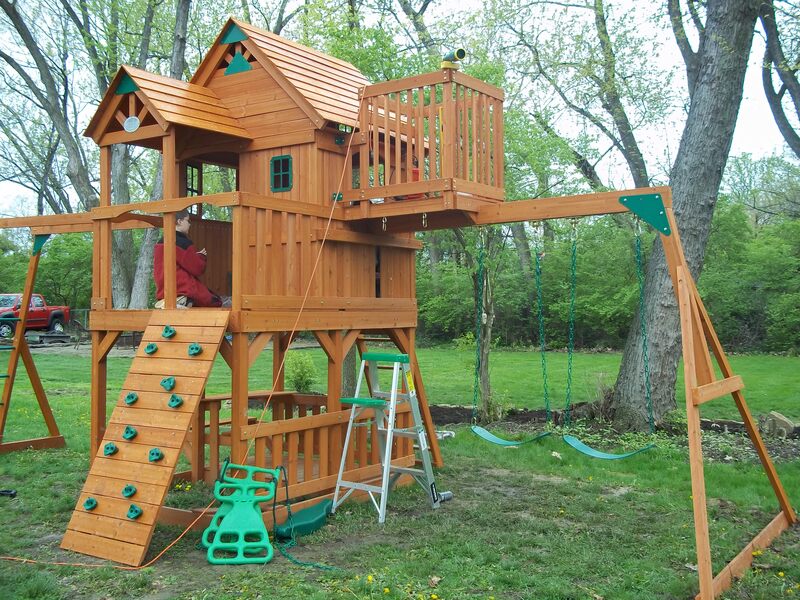 This entry (permalink) was posted on Tuesday, April 26th, 2011 at 10:52 AM by Dan Miller and categorized in family, kids, skyfort playset. I’ve been putting up the same playset for the past three days. We are going a little out of order so our daughter can have something to play on while we finish. Tomorrow we add the monkey bars, swings and crows nest leaving us with just the roofs and trim. I agree with the instructions being horrible and the fit being slightly off on some things. Nice blog entries. Found your blog by a simple Google search on SkyFort Assembly. We’re thinking of buying the same set – now that you’ve completed all the steps (lots of steps! ), how do you feel about the materials? Does it seem sturdy? Strong enough for an adult? Hope to hear more! Definitely sturdy and strong enough for an adult. 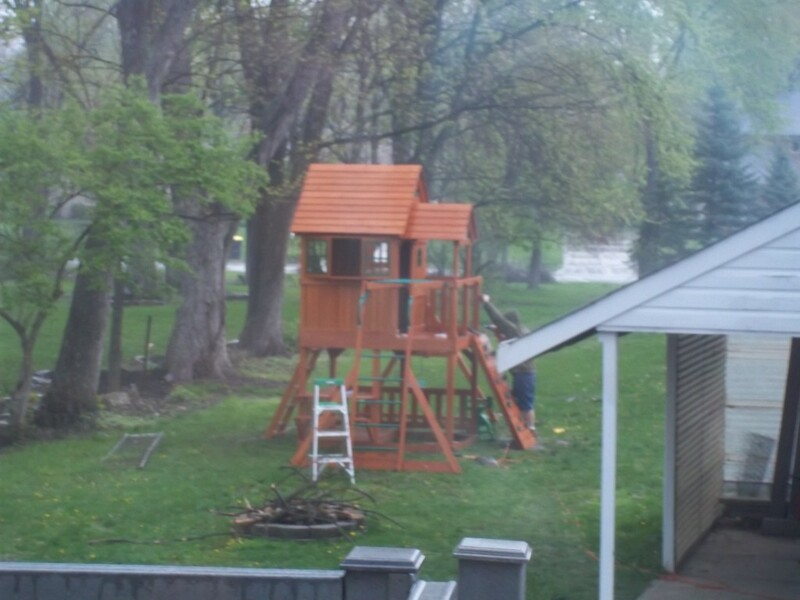 The playset is actually (pretty much) done now and looks great. I like your blog. Am about to start construction. Did you pre-treat the wood? Or do you think you have to? I think I read that on Sam’s Club website. 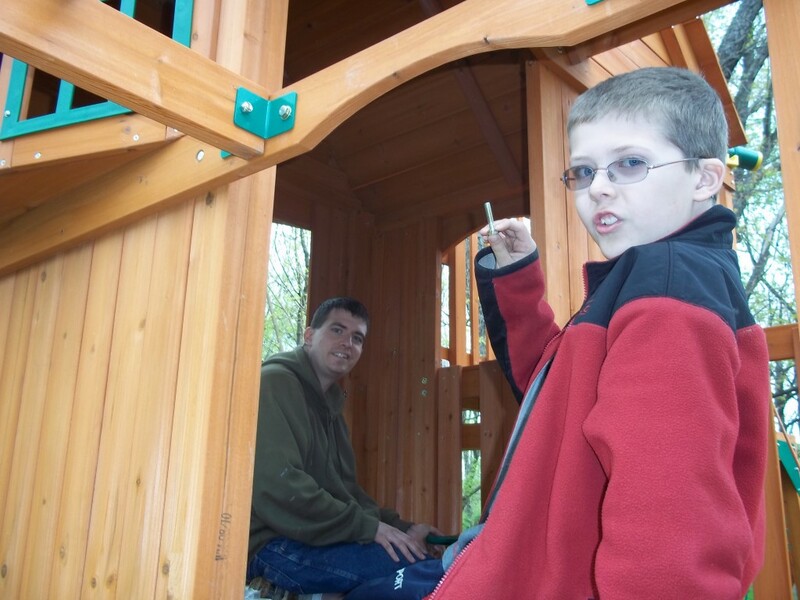 We bought this playhouse for our son about 3 years ago and we never pre-treated it. We are planning on staining it so I was wondering what stain and how did you prep it for stain? Dan, came across your blog by accident looking up some info on the Skyfort for a customer of mine. 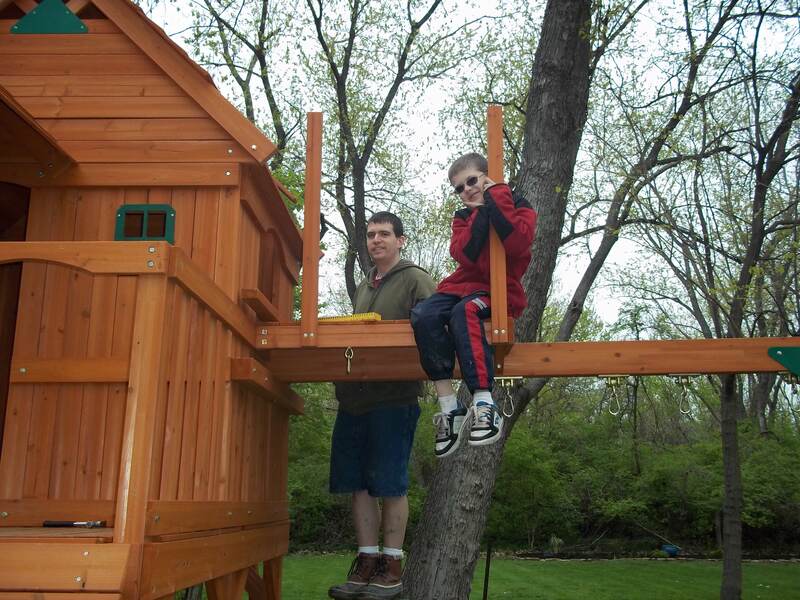 I install wooden playsets fulltime & that is THE MOST time consumming installs I have done! I’ve done a bunch of them & have managed to get it done in about 14 hrs. Another one from the same co. the Woodridge is just as bad! Love the blog! We are starting a sky fort on sat we have built other play sets any tips? I’ll be putting together the Skyfort for my little girl soon, and I’ve been reading this site to get tips. One thing to note is that they’ve changed the model number of the playset, and have made some substantial changes that will make things easier in certain steps. The floors of the base and tower, the roofs of the tower and porch as well as the windows of the bays now come as panels. There are four floor panels and 4 roof panels for each, and the windows are pre-assembled. They’ve also added pieces here and there and taken others away. It should make the assembly a LITTLE easier. Fastest one I’ve built is now 7 hours with two other guys. Fastest I’ve done with 2 is 12 hours. Building the nest in the ground is much easier. Good job.